This is the story of events that actually happened and that you will read later on.Pietro Pigafetta, a descendant of Antonio Pigafetta, tells this story.Thanks to documents and memoirs, passed down from generation to generation, I could put together many details of that era and the great journey of Magellan and Pigafetta.A good part of the story was written in the book, “Primo viaggio intorno al globo terracqueo” (First trip around the globe) by Antonio Pigafetta.A very important detail, which can be defined as a mystery, is the death of this great navigator.There are many assumptions told by several writers and historians.It is presumed that he died far from his home in Vicenza, since no grave or tomb was never found.We know for sure that by the end of August 1525 no trace of Antonio Pigafetta was ever found.An old family tradition, handed down from father to son, from the Pigafetta family of Agugliaro, states that Antonio died in the Aegean Sea during a naval battle between the Venetians and the Turks. Pigafetta, who diligently described the long and difficult journey, introduced himself to Emperor Charles V and handed over the precious manuscripts. Then he went to King John of Portugal, and gave him a few items brought over from the East and some writings on the navigation system. He did the same things with the king of France, Francis I. Between 1524 and 1525, Pigafetta composed the Report of the first voyage around the world in Italian with the Treaty of the Sphere, his memoirs about the journey, starting with meticulous diaries that he kept during the three-year journey. 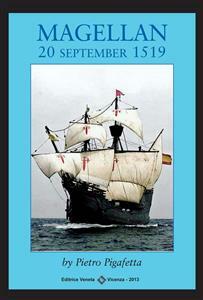 The real diary of the first voyage around the world, given as a gift to Charles V, disappeared into thin air, since the Spanish court was very determined to erase the merits of the Portuguese sailor, Magellan, for the first sailing around the world.As a result, Antonio Pigafetta, inconvenient witness of what happened during the trip, was hastily dismissed by the Emperor.Back in Italy, Pigafetta was called to the court of the Marquis of Mantua, then by the Doge Andrea Gritti and finally also by Pope Clement VII, who wanted to know something of this wonderful journey along unfamiliar routes.Pigafetta, perhaps because of his virtues, having known the great master of Rhodes, Philippe Villiers de Lisle-Adam, was received into the Order of the Knights of Malta. He then devoted himself to writing all the things seen on his long journey and the navigation system. In August of 1525, while he was waiting for his book to be printed, he sailed under the command of one of the six galleys which clashed with the Turks in the Aegean Sea. Everybody died on this trip. Antonio Pigafetta’s body was never found. For several months, in 1519, there was talk of a strange journey. At that time Spain was adamant and real busy with geographical discoveries. The great continents donated by Columbus, Vespucci, Cortez and Pizarro were not enough for them, they did not accept the achievements of the Portuguese, who searched for new routes to the East, especially towards the two Indies and southern Africa, discovering fascinating lands, full of valuable goods, especially spices.At that time bishop Francis Chiericati, papal nuncio to Henry VIII, King of England, returned to Rome after having completed his mission.After a few days the bishop was appointed a new assignment by Pope Leo X, which was to go to Charles V as a spokesman of the pope in order to invite him to participate in a crusade against the Sultan Selim, who was threatening Christendom.